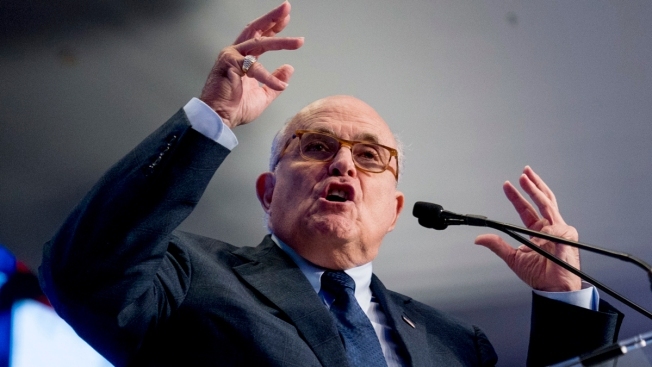 In this May 5, 2018, file photo, Rudy Giuliani, an attorney for President Donald Trump, speaks in Washington. President Donald Trump on Sunday tweeted again what he has repeated for months: there was "no collision" between his campaign and Russia. But on Monday, NBC News reported, his personal attorney Rudy Giuliani took a different tack, downplaying in two interviews the seriousness of collusion. "I have been sitting here trying to find collusion as a crime. Collusion is not a crime," Giuliani said in an interview on "Fox and Friends" Monday morning. A little later, during an interview with CNN's "New Day," Giuliani said, "Colluding about Russians, I don't even know if that’s a crime, colluding with the Russians. Hacking is the crime." While there is no statute covering "colluding" with a foreign power, it is illegal to conspire to violate laws against hacking and foreign participation in elections, NBC News reported.